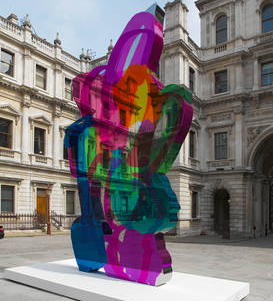 The Royal Academy's annual Summer Exhibition is now upon us, and this year looks to be as exciting as ever. The Summer Exhibition, held in London, is the worlds largest open submission contemporary art show, that showcases the work of emerging and established painters, sculptors, photographers, printmakers, architects and film makers. This will be the 243rd year that the exhibition has taken place, which is quite an achievement given the rate at which such events pop up and disappear in today's art world. The show this year has been co-ordinated by Royal Academician Christopher Le Brun, and runs from the 7th June through to the 15th August. The Summer Exhibition was founded on the principle of opening up a grand exhibition space to all artists of 'distinguished merit'. The exhibition aims to finance the training of young artists at the RA schools, and 243 years on, still continues to play a major role in raising funds for the students. Each year, the Summer Exhibition receives over 12,000 entries from over 27 countries, and offers visitors the opportunity to buy original works of art by both high profile, and up-and-coming artists. Gallereo is going to be taking a trip to see the show early next month. If you're in London, make sure you drop by! Details can be found on the Royal Academy website.